Bust Out At Full Speed!!! The Flamin’ Groovies are one of the most awesome (if slightly confusing) bands ever! I’ll cover the confusion in the For Weirdos Only section below. 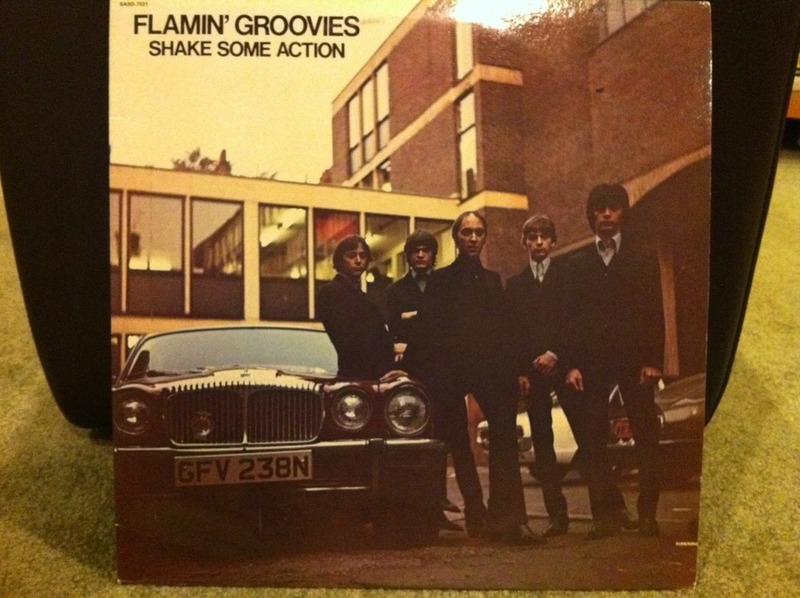 This long-player - Shake Some Action - is my favorite Flamin’ Groovies album. Of the second era. This is the Cyril Jordan led version of the band with Chris Wilson singing vocals. It sounds real treble-y and jangle-y and super rocking. To my ears it sounds like The Beatles married Bob Dylan and gave birth to their baby - the Flamin’ Groovies - on a flamin’ red Rickenbacker 12 string electric guitar. Every time I listen to this album it takes me back to junior high. I remember gambling on this album because it looked so cool and it was on the Sire label. I loved the Ramones and the Talking Heads at the time and they were on Sire so I thought these Flamin’ Groovies had promise. And promise they did. They promised to kick me in the arse with every listen. They rocked hard and there’s not a weak song on this record. Not one. There’s only one weak thing about this album in my opinion. It sounds like it was recorded beneath a million cotton balls inside a gauze wrapped cocoon of felt. Maybe I’m exaggerating. This is one of very few instances where I think the recent Rhino UK collection “Flamin’ Groovies At Full Speed: The Complete Sire Recordings” sounds better on compact disc. If you know me, then you know I love the sound of wax. Vinyl. The LP. The rekkid. But this one sounds better on this new CD collection. Flamin’ Groovies At Full Speed: The Complete Sire Recordings is a great deal because it sounds awesome, you get some unreleased and rare tracks and if you don’t buy it you’ll be making a huge mistake. It contains all three of their mind-blowing Sire records - Shake Some Action, Flamin’ Groovies Now and Jumpin’ In The Night. Trust me. They’re awesome. Three slabs of wax on two compact discs. Do it! In large part, I credit the Flamin’ Groovies with getting me interested in a band I’ll cover in much detail later - The Beatles. For Weirdos Only: Shake Some Action came out in 1976. It was their first new LP of new music since 1971’s Teenage Head (my favorite album of the 1st era). Shake Some Action’s sound is nothing like that of the first era Flamin’ Groovies. That band had a harder Stones-y rockabilly edge that was amazing in it’s way. I happen to love both eras - the Roy Loney/Cyril Jordan led first era and the Cyril Jordan/Chris Wilson led second era. For Weirdos Only (part 2): If you look closely, you can see a small (¾") horizontal slice in the album jacket at bottom right. Cheapskate rock ‘n’ rollers will recognize this right away as a “cut-out” record. For the uninitiated, you could find bins and bins of these “cut-out” records at your local record store for between $1 - $4 or so back in the 70s and 80s. They were records that didn’t sell well and were “cut” to render them identifiable as cut-outs and then sold cheap to get rid of them. That’s how I found this record. Most likely next to a Fleetwood Mac Tusk album. Yuck.